Chip in for a Cure! Posted By PA Breast Cancer Coalition on April 29th, 2010 at 3:57 pm | 984 comments. 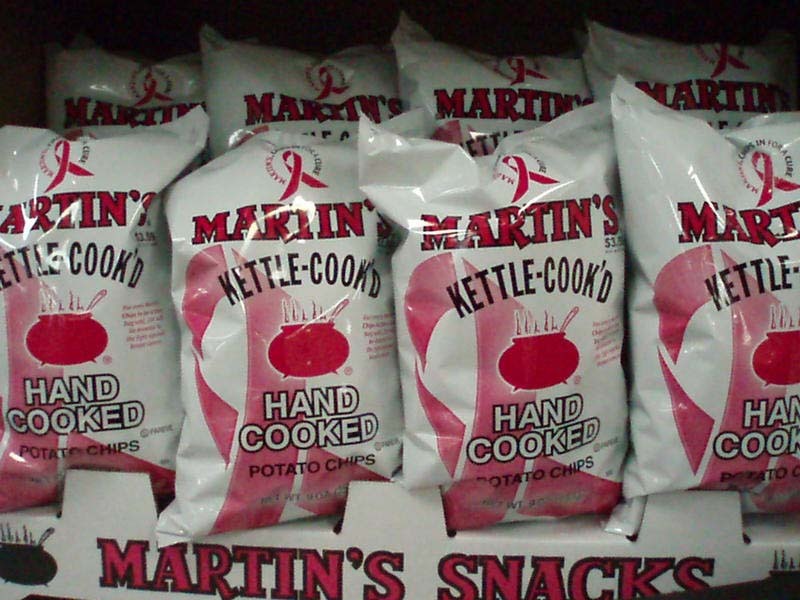 No, you’re not seeing things….those bags of Martin’s Kettle Cook’d-Chips really are pink! And the sale of those bags of chips in stores all across Pennsylvania benefits the PBCC! Martin’s Potato Chips partnered with us back in October to sell specially-designed bags of their most popular chips and they were a huge hit! Amazingly, Martin’s was able to donate over $23,000 to the PBCC last fall and hopes to do the same this May. So, visit your local grocery store before May 8th, find the 9 oz. bag of Martin’s Kettle-Cook’d chips with the pink ribbon on it, and put one or more in your shopping cart. The PBCC will receive 25 cents from each purchase. Please visit the Martin’s website for more info. Looking for a support group? Look no further! Posted By PA Breast Cancer Coalition on April 27th, 2010 at 11:00 am | 114 comments. Have you recently been diagnosed with breast cancer and are looking for a support group? Do you need to talk to others who have been where you are? Is someone you love in this situation? Are you at a loss for where to find groups in your area? Well, the PBCC has the answer! We have compiled a list of over 100 support groups across Pennsylvania, listing the group name, location, meeting days and times, and facilitators’ information if known. Most of the groups are specifically for breast cancer support, but some are for anyone dealing with any type of cancer. Some are geared toward a specific population such as African-American women, Latinas, young women, or those dealing with Stage IV or metastatic cancer. Some groups focus on a specific facet of recovery such as exercise or spirituality. Many are open to family members and loved ones. Some meet in hospitals, some in women’s homes, and others in community centers or restaurants. Many provide refreshments. All are free of charge. Check the notes for specifics on the particular group you are interested in. We recommend you call the number on the listing to verify the group’s information. Support groups sometimes change their meeting days or times without our knowledge so please call the facilitators before you decide to attend a meeting! Finally, if you are a breast cancer (or general cancer) support group facilitator, or even just a regular attendee of one of these groups, we need your help! Please visit our website and see if your group is listed. If it is, do we have all the details correct? If you see errors or if you know of a group not on our list, please email Kim at kim@pabreastcancer.org with the details and we’ll add them right away. Posted By PA Breast Cancer Coalition on April 9th, 2010 at 2:28 pm | 123 comments. You’ve seen your state legislators in their pinstripe suits and ties. You’ve seen them shaking hands and kissing babies during election years. But you’ve never seen them like this! 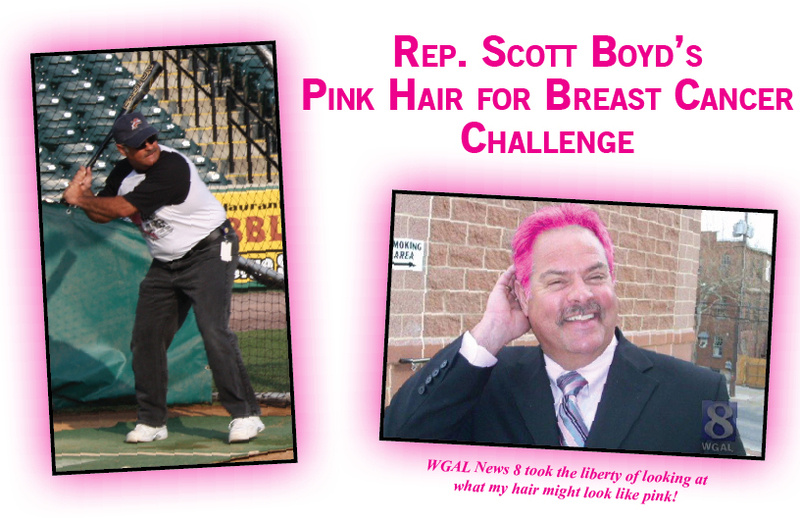 Representative Scott Boyd will dye his hair pink when $10,000 is raised to support the PA Breast Cancer Coalition (PBCC) through the Take a Swing Against Breast Cancer Home Run Derby. To take Representative Boyd up on his challenge and donate to see his hair turn pink, visit www.ScottBoydsPinkHair.com. “If we can raise $10,000 for the Pennsylvania Breast Cancer Coalition, I will dye my hair pink for the first home run derby event of 2010 on Thursday, July 1st at Metro Bank Park with the Harrisburg Senators. This is a great way, no matter what your political affiliation, for every person to support the PBCC,” said Boyd. The Take a Swing Against Breast Cancer Home Run Derby is a partnership between the PBCC and the PA Association of Community Bankers (PACB). The Home Run Derby events take place in all 11 minor league baseball stadiums throughout Pennsylvania. A complete schedule and more information on how you can sponsor, play or volunteer can be found at www.PaHomeRunDerby.org or by calling 800-377-8828 x102. There’s Good Inside Us All! Posted By PA Breast Cancer Coalition on April 9th, 2010 at 8:58 am | 10 comments. The PBCC doesn’t spend a lot on advertising. We just don’t feel that’s a good use of our donor dollars. We’d rather use your hard-earned money to increase awareness and to provide direct services for survivors. But you can be a walking billboard for the PBCC and breast cancer awareness by purchasing one of these t-shirts designed by Greater Than Goods! Greater Than Goods is a company that believes “there’s good inside us all.” They partner with non-profit organizations, including the PBCC, to create cause-related shirts. Then they share the proceeds with those organizations to work toward recovery, to help find cures, to provide hope. For each $20 PBCC shirt purchased, they donate $5 to our organization. The PBCC shirts sport a hand-drawn design on the front that is an artistic representation of intertwining DNA, the mother/daughter bond, the past and the future. Click here to purchase either the ladies’ fitted raspberry shirt or the men’s gray shirt. And thanks for helping spread the word! Posted By PA Breast Cancer Coalition on April 7th, 2010 at 10:46 am | 108 comments. What are all these women raving about? The PBCC’s Friends Like Me care package, that’s what! Every week we send about a dozen Friends Like Me care packages to women who live in Pennsylvania and have been recently diagnosed with breast cancer. (Click here to request one for yourself or someone you know.) The package is filled to the brim with important information about breast cancer surgery and treatment. We know the women who receive these care packages appreciate the educational stuff. They tell us so in every survey they send back. But my heart tells me that the best parts of the care package, the things that make these women feel like they are not alone, are the “soft touches”…the hand-knit scarves and chemo caps, the sweet construction paper “thinking of you” cards crafted by children, the paper clip angel ornaments made by Girl Scouts, the pink pins to wear proudly as a symbol of strength. 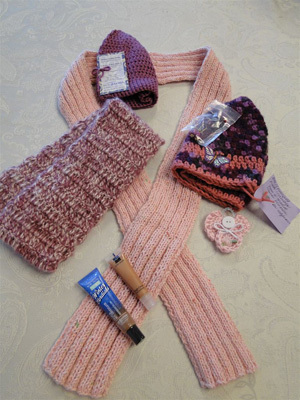 These are the things that warm the hearts of the women who receive a care package. And these are the things the PBCC relies on you to donate! The possibilities are endless, the benefits, immeasurable. And the ripples of your kindness will linger long after that pink box has been emptied and tossed in the trash. Posted By PA Breast Cancer Coalition on April 6th, 2010 at 8:15 am | 231 comments. The PBCC participates in numerous ways for Internet users to fight breast cancer. One of our partners, GoodSearch, is holding a special donation period for the next three days. GoodSearch will donate a $1 for every toolbar that is downloaded between April 6th at 9am EST and April 9th at 9am EST up to $5,000!! Download the toolbar right now! Our new PBCC toolbar is FREE to download and allows you to raise money for our cause every time you search or shop online! Once added to IE or Firefox, each time you shop at more than 1,300 stores (from Amazon to Zazzle!) a percentage of your purchase will automatically be donated to PBCC- at no cost to you (and you may even save money as the toolbar provides coupons and deals as well!). The toolbar also has a search box and each time you search the Internet, about a penny is donated to PBCC. Please hurry and do this now so that we can earn the $1 bonus per toolbar! And, please pass this along to all of your friends! The two minutes it takes to add this toolbar to your browser can make a lifetime of difference for our cause! Posted By PA Breast Cancer Coalition on April 2nd, 2010 at 9:36 am | 120 comments. Pennsylvania jewelry designer, Riz Soulliard, designed these bangles when her own mother got the news that she too, like many others, had breast cancer. Riz made them for women of all ages who would like to wear these beautiful bangles to show support and contribute to the mission to end breast cancer. Pretty pink ribbons that unite women all over the world boldly stand out on two white bangles and a beautiful solid pink bangle separates the two. Wear them in the hope that someday we will find a cure. Click here to buy these bangles from her website. 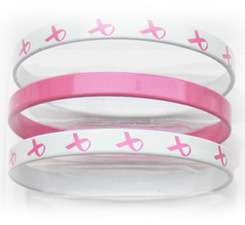 50% of the proceeds from the sale of these bangles will go directly to the PBCC.